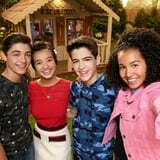 Disney Channel continues to make progressive steps forward with its show Andi Mack, especially with the storyline of Cyrus Goodman. Back in season two, Cyrus (played by actor Joshua Rush) made history as the first Disney Channel character to come out as gay in the network's history. In Friday's episode, Cyrus continued living his truth and opened up to his best friend Beck about his sexuality. This is reportedly the first time a Disney Channel character has said "I'm gay" in an episode.